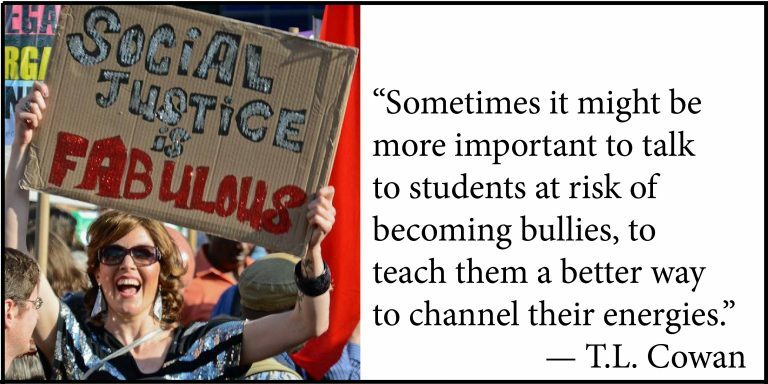 This post concludes the series that DML Central has been running based on interviews with members of the development team for the Center for Solutions to Online Violence by focusing on T. L. Cowan of the University of Toronto, who describes herself as a “writer, performer, activist, and professor” committed to anti-violence work. Within the context of her graduate studies, Cowan explained that she realized that her history of anti-violence activism intersected with the kinds of ethical practices she was trying to put to use in her research: “as a performance studies scholar, one of the things I realized early on was that the advent of YouTube and MySpace was changing my field.” Instead of only having access to “a live show or certified copy,” cell phones could broadcast content without “consent and permission” and often “without the performer knowing.” In thinking through how performance studies, anti-violence work, and digital culture might be related, she was impressed by the usefulness of tools like the CSOV’s “power and control wheel,” developed by the Alchemists, or Mikki Kendall’s graphic story Paths as ways to think broadly about ethics, and pedagogies, including those ethics of scholars and teachers. “We need to think about mitigating harm to those deeply invested” in online self-publishing. Cowan is particularly wary of initiatives that push “digital hygiene” on young people. “I grew up low income, and I can’t handle this language any more. I had my hygiene surveyed continuously.” Cowan asserted that hygiene is a way to monitor and penalize “negatively racialized, negatively gendered, and underclassed” people, and to reproduce this discourse in the context of online safety and protection just perpetuates these modes of exclusion; it is a discourse that is completely unhelpful. Perfection isn’t a useful goal; if anything, it keeps amateurs from getting their feet wet and authors from finishing their works. It’s an ideal that hinders more than it serves. Imperfections, creative accidents, and compromises, on the other hand, give a game personality and individuality.